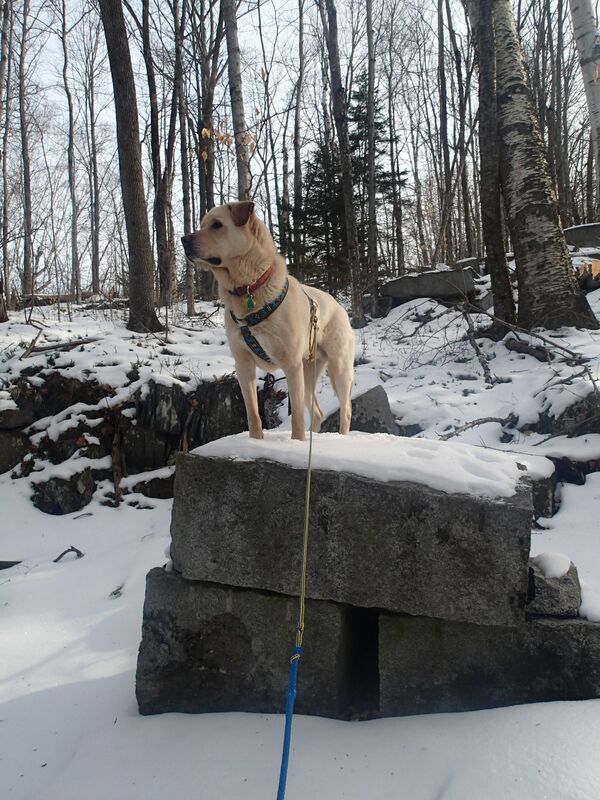 QUARRY TRAILS…and Quirky Tails! | Vermont Paddle Pups! The week started off with a brief warm spell…30 whole fahrenheit degrees mid-day, and a little fresh snow. 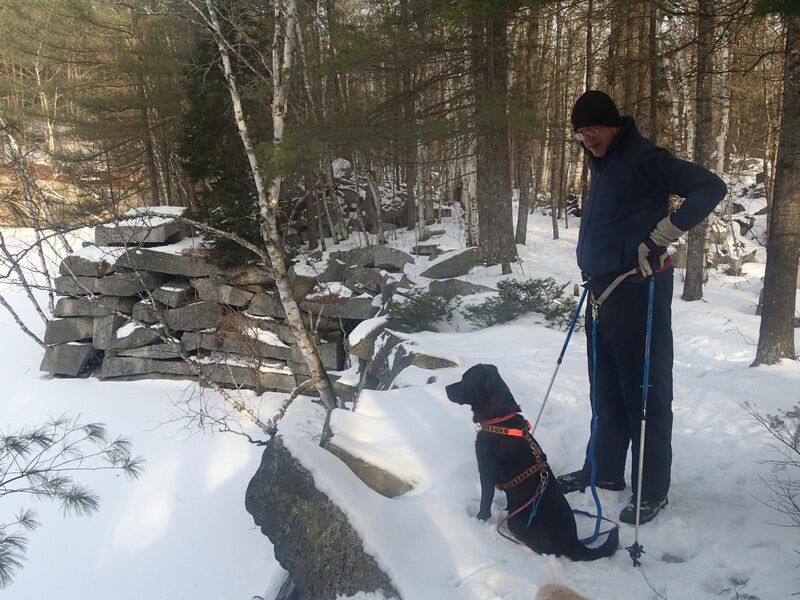 Griff was anxious to get out, so off we went, for a short, easy, ski near our home. I was taking it easy with Griff, because he has developed a “quirky tail”…his bodacious curly tail one of his most obvious physical features was somehow recently injured. Perhaps a case of “limber tail” aka “swimmers tail”, or “cold tail”. (http://www.askavetquestion.com/limbertail.php ). A trip to the vet reassured us it is not broken, and may have been injured while rough-housing with Edgar. Some anti-inflammatory meds seem to be indicated. In any case, it does not seem to bother him at all, and he has been anxious to get out and be active. The cold weather hit us with a bang again on Tuesday, so it was not until Thursday that we trekked out again. My sister-in-law is also an avid outdoors-woman, so we took both dogs out, to a local trail that runs along a river that ( in the summer) roars as it rushes over falls and through chasms. This day, it was peaceful and quiet, with beautiful ice formations. I used the trekking lead with Edgar, as he can be a bit more “active”, and my sister in law is not used to hiking with a trekking lead. At first, Griff was a bit unsettled with his not having ME behind him, but he quickly got with the program, and had a wonderful time. Both dogs appreciated the chance to get out together mid-week! Aunt Jackie and her Trail Buddies! Where is that curly tail? 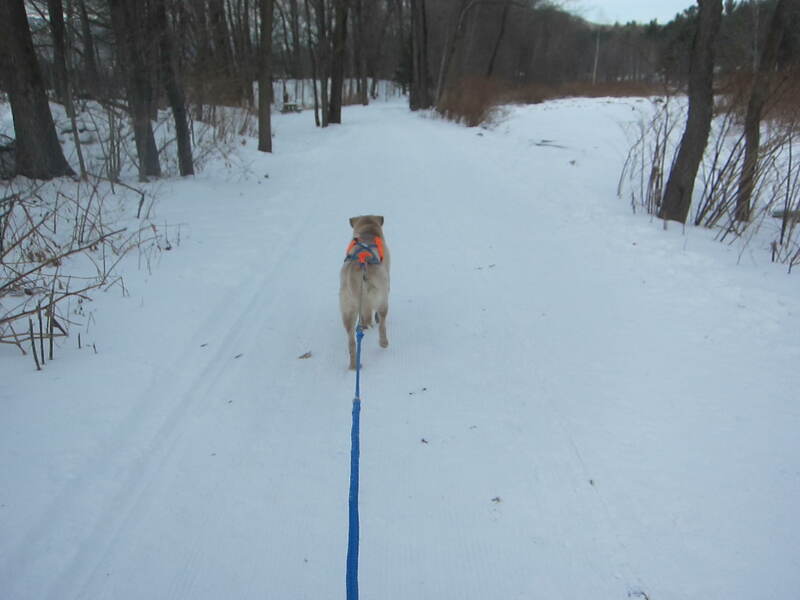 Friday was a chance to get out skijoring again…our 5 mile recreation path was freshly groomed, so we had soft, untracked corduroy…Griff kept his steady,loping pace, and I only had one wipe-out! On trail! 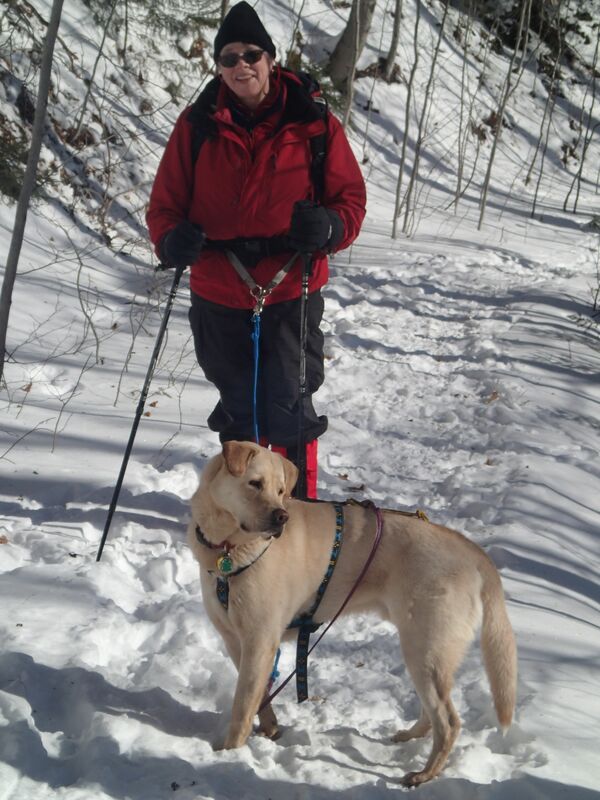 Skiing alongside the West Branch of the Little River….5 miles downstream of where we hiked the day before! The forecast for Saturday involved a messy mix of rain,sleet and snow arriving in the afternoon. 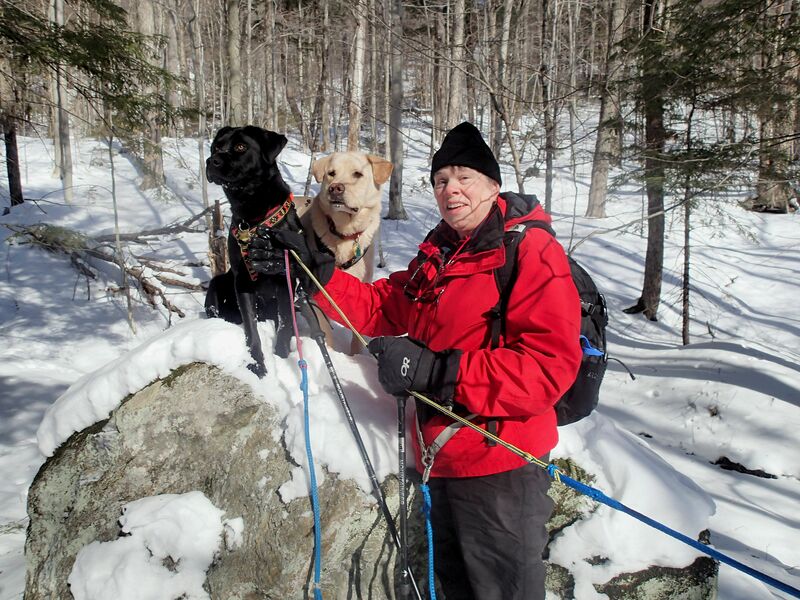 So we headed out early, for an amazing trail network located near the “Granite Capital of the World”, Barre,VT. 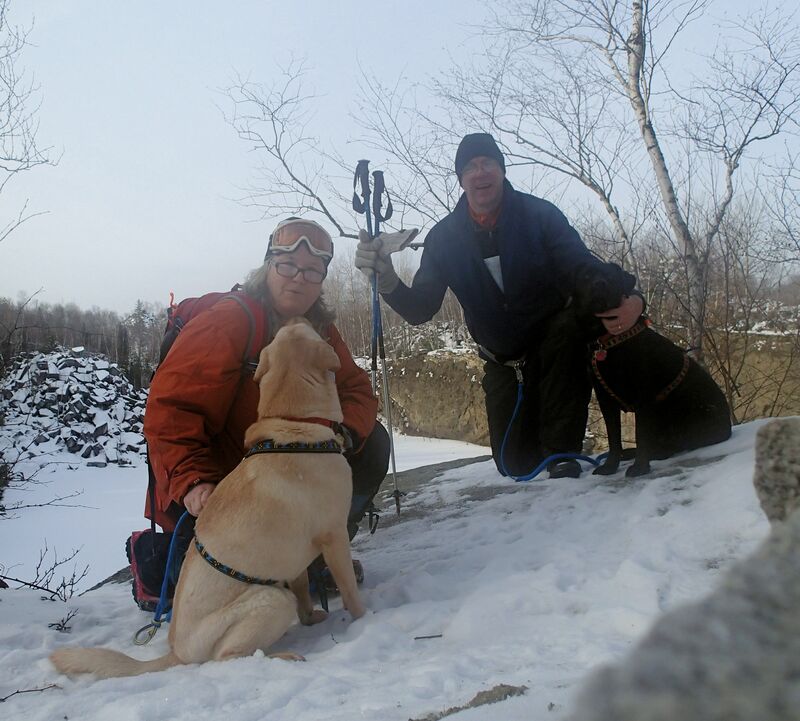 It was microspikes conditions, 28 degrees, and partly sunny…we saw not another hiker, but the dogs found lots of great wildlife smells! This is primarily a mountain bike center, but in the winter is open, with free access, for skiers and snow shoers. 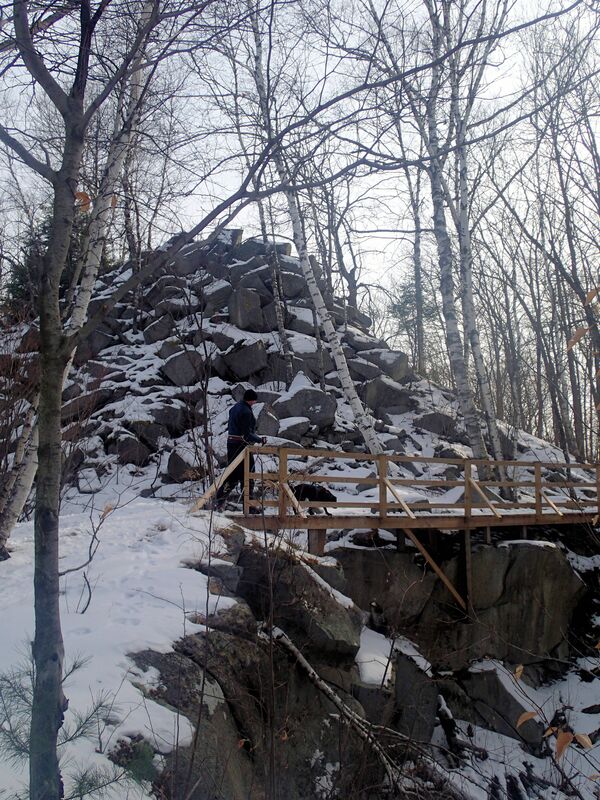 “The 50 historic quarry sites with their water filled abandoned quarries and evocative quarry ruins provide some of the most unique scenery in Vermont. The dozen or so rock pile lookouts, surprisingly accessible, provide amazing scenic vistas, at times extending almost 75 miles”. In the summer, the quarries are filled with emerald green water…at this time of year, they are pristine white sheets, and the trails negotiate the rocky cliffs and outcroppings. Only about 30 feet down to the water here. A LONG way down from here, and long views across the quarry. There is railing only on the right side…Edgar didn’t seem to mind, but Griff was not thrilled! So, as February comes upon us, we look forward to the return of fluffy snow, sunny days, warmer temps, and a very special curly tail!